Once upon a time a phenomenon existed in medieval Europe that continuously fueled local lore: during the long winter nights a strange and unknown troop could be heard passing outside over the land or through the air. Anyone caught by surprise in the open fields or depths of the woods would see a bizarre procession of demons, giants, hounds, ladies of the night, soldiers, and knights, some covered in blood and others carrying their heads beneath their arms. This was the Wild or Infernal Hunt, the host of the damned, the phantom army of the night--a theme that still inspires poets, writers, and painters to this day. Millennia older than Christianity, this pagan belief was employed by the church to spread their doctrine, with the shapeshifters' and giants of the pagan nightly processions becoming sinners led by demons seeking out unwary souls to add to their retinues. Myth or legend, it represents a belief that has deep roots in Europe, particularly Celtic and Scandinavian countries. The first scholar to fully examine this myth in each of its myriad forms, Claude Lecouteux strips away the Christian gloss and shows how the Wild Hunt was an integral part of the pagan worldview and the structure of their societies. Additionally, he looks at how secret societies of medieval Europe reenacted these ghostly processions through cult rituals culminating in masquerades and carnival-like cavalcades often associated with astral doubles, visions of the afterlife, belief in multiple souls, and prophecies of impending death. He reveals how the nearly infinite variations of this myth are a still living, evolving tradition that offers us a window into the world in which our ancestors lived. Andad de día, que la noche es mia. Certain nights play host to the passage of all kinds of nocturnal troops. These legions were sometimes composed of the living led by Diana and Herodias, Satia and Dame Abonde, or alleged witches whose doubles had quit their sleeping bodies. Sometimes they gathered together the dead, revenants, or damned souls who could find no rest (the Mesnie Hellequin, Oskoreia, Asgardreia). Finally, demons or the devil in person, or their minions, could be seen walking or riding in the darkness. On every occasion these figures were associated with a specific kind of activity, and it is worth examining the accounts in detail if we wish to avoid the erroneous combinations and confusion that make understanding these nocturnal throngs so difficult. Moreover, this confusion is not due solely to the nineteenth and twentieth-century researchers but goes all the way back to the Middle Ages. We encounter the first instance of the belief in the Ladies of the Night in a canon attributed to the Council of Ancyra that met in 314. However, this canon’s first known appearance was in 872 in the capitularies of Charles the Bald. It was then picked up anew in 899, in a treatise by Régino, the Abbot of Prûm. This also is not to be omitted, that certain wicked women, turned back to Satan, seduced by demonic illusions and phantasms, believe of themselves and profess to ride upon certain beasts in the nighttime hours with Diana, the Goddess of the Pagan, or Herodias, and an innumerable multitude of women, and to traverse great spaces of the earth in the silence of the dead of night, and to be subject to her laws as of a Lady, and on fixed nights be called to her service. This text, known as the Canon Episcopi, inserted around 1066 by Burchard of Worms in his Decretum, offers evidence that the church was attacking an allegedly pagan belief that was still vigorous enough to be viewed as dangerous. Have you believed what many women, turning back to Satan, believe and affirm to be true, as you imagine in the silence of the night when you have gone to bed and your husband lies in your bosom, that while you are in bodily form you can go out by closed doors and are able to cross the spaces of the world with others deceived by the like error and without visible weapons slay persons who have been baptized and redeemed by the blood of Christ . . .
Have you believed as certain women are accustomed to believe, to wit that by virtue of other limbs provided you by the devil (Christian interpretation of creating a double) you have crossed in the silence of the quiet night through closed doors to fly into the clouds where you have waged battle on others [women], both inflicting and receiving wounds. These women who roam the night fight the same battle as the sixteenth-century Benandanti, who performed a functional ritual. Here the representatives of good and evil, the fertility and sterility of the land, would confront each other. The wicked individuals of one of these bands would steal the seeds, the others, working for good, would try to hold the wicked in check. The victory of the “good folk” over the wicked ones would make it possible for the coming year to be a fruitful one. Have you believed that there is any woman who can do that which some, deceived by the devil, affirm that they must do of necessity or by his command, to wit with a host of devils transformed into the likenesses of women, she who common folly calls Holda, must ride on certain beasts during special nights and be counted as members of the company of demons. Burchard does not understand the phenomenon of a split personality and attributes it to a “necessity” or a “command.” In fact, it is rather a gift, an atavism. According to the beliefs of earlier times, every human being possessed several “souls,” with the word soul meaning “vital principal” in this instance. Among these souls there is the external soul, which the ancient Germans called the hamr, and which Latin texts refer to as animus or spiritus. It is able to quit the body when it is sleeping,is in a coma or a trance, or when it is afflicted by a serious illness. It can then go about its own business in the form of an animal or human. The clerics were unable to grasp this, observing only that the body was still actually present before their eyes, and they attributed the stories of people whose double had rejoined their bodies to tricks and glamors of the devil. “One of the most frightening and persistent visions recorded throughout Indo-European history, legend, and folklore is the spectral array of the Wild Hunt. 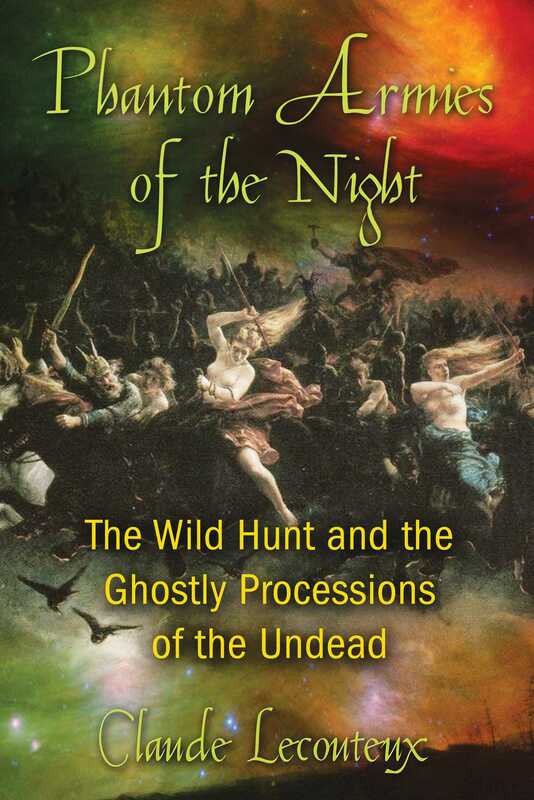 Claude Lecouteux’s brilliant scholarly detective work results in the definitive study of these ghastly processions that have haunted the night skies of Europe for millennia. Phantom Armies of the Night is teeming with tales that will fascinate, delight, and terrify--often all at once.